GAUTHAM MENON HEROINE SPEAKS OUT! Gautham Menon began his film Enai Noki Paayum Thotta with Dhanush as the lead yesterday, the 14th of March. 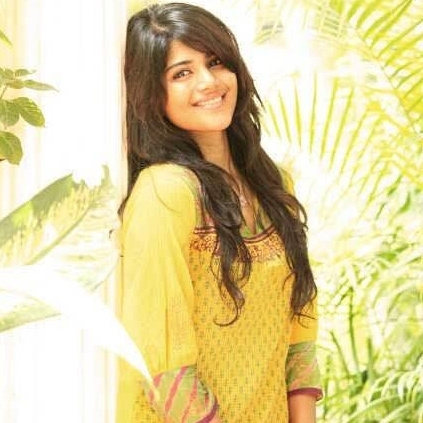 Megha Akash of Oru Pakka Kadhai fame has been roped in as the heroine in this flick. We got in touch with the young actress on how it is to bag a Gautham Menon film so early in her career and this is what she had to say, “I am very happy and excited. I had in fact told behindwoods in my interview that I would like to work with Gautham Menon sir and Dhanush sir. I never expected my dream to come true so fast and that too in one combination. I should thank behindwoods for this. I completed the usual screen test and look test and I was selected. It was too quick to fathom what was happening and I was in the project. Shooting began yesterday and I cannot reveal about my role now. I am sure I am going to learn a lot in this. I was nervous initially, but the entire crew including Gautham sir and Dhanush sir made me feel so comfortable. I am really lucky and blessed to be a part of this film”. We wish you the best Megha! Gautham And Dhanush's Enai Noki Paayum Thota Goes On Floors. People looking for online information on Enai Noki Paayum Thota, Megha Akash will find this news story useful.